In case you find yourself in the 2014 Olympic host city, RIR has a list of activities you absolutely should not miss. Yachts are available to take visitors on a cruise along the Black Sea coast. The yachts and boats moored at the port are ready to set sail at a moment's notice. Take a bottle of wine or a thermos of mulled wine on your cruise and relax in the privacy of the open sea. Try some local honey, otherwise known as "liquid gold." This natural delicacy is gathered in local apiaries in huge quantities. There are a number of bee farms clustered along the road to Krasnaya Polyana. Honey obtained from chestnut, linden, or acacia trees is sold for 800 roubles ($25) per litre. Sometimes nuts are added to the honey. You need to taste jam made from feijoa (a fruit related to guava). Locals prepare the jam without boiling the fruit and just add sugar. This ensures that the nutritious value is preserved. Sochi's wine tasting halls offer guests dozens of varieties of professionally made and homemade wines. Locals make their own wines in the fall, as soon as the grapes ripen in their yard or at their dachas. Mostly red wine is made from the Isabella grape. The infused beverage is poured into regular plastic bottles that held mineral water and stored in a cold place. You can find wine made by local winemaking enthusiasts at city food markets where they sell churchkhela (sweets made from grapes, nuts, and flour). It must be fresh, just out of a Georgian tandoor oven. This flat bread shaped like a large drop is baked in just about every corner of the city. Bakers knead the dough and make it right in front of the customers. Fresh Georgian lavash, which has a faintly salty taste, can be eaten with sugar and tea, milk, kefir, or sweet sparkling water. Lavash goes well with meat or vegetarian meals. Sochi is proud of its tea, which is grown the northernmost grown tea in the world. The tea, which has a very delicate aroma and rich taste, is harvested at the Dagomys plantations, and the villages of Matsesta and Adler. Often different herbs that grow in the Caucasus Mountains are added to the tea. You can also take a tour at the Tea House, where a Russian samovar is steaming almost around the clock. In Sochi, you can swim all year round. The brave among the lot visit the city's beaches, but those who like it a little warmer swim in pools with heated seawater. The largest outdoor swimming pool is located in the centre of Sochi at Pearl Hotel. Even when the outside air temperature is below freezing, the water in this pool is always at least 26°C (79F). Touch an ancient giant and make a wish in the Tiso-Samshitovaya Roshcha (Yew Boxwood Grove), located in the village of Khosta. Along the way you will encounter a steep rocky cliff with eagles circling overhead. Nearby are trees tied with hundreds of colourful ribbons. It is believed that people who leave a ribbon in the grove will definitely come back here again someday. 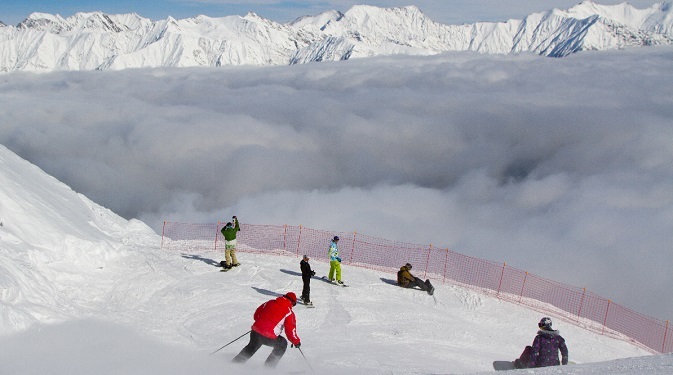 The Sochi mountains are an ideal place for winter sports. During the Olympics, tourists can ski on the slopes of Mountain Carousel, which is a Games venue. Sports equipment can be rented at numerous places in Krasnaya Polyana. If you find yourself at a real Caucasian feast with a hundred or even two hundred guests, get ready to eat and drink a lot. Lamb or pork kababs are grilled continuously at these parties, and the hosts make sure that no one's wine glass is ever empty. The most important advice in these situations is to not let them convince you to drink more than you can handle. Ask for a regular glass, since the traditional "horn of plenty" is a special vessel with a pointed bottom and holds up to a litre of wine. After every toast you must down your whole glass. Otherwise, the hosts might think you have disrespected their hospitality. In earlier times, Caucasian feasts sometimes lasted several days. Konditerskaya Alyonka (Alyonka Pastry Shop) located in the centre of Sochi is an important reminder of the Soviet heritage for the locals. Here they make pastries with a taste familiar to every Russian from his or her childhood. They haven't changed the names of the pastries either, there's the bouche, éclair, choux, and tartlet. Go in and try. By the way, even the interior of the shop hasn't changed in 30 years.